On February 19, Advancement Project’s National Office traveled to Atlanta to testify at the Congressional Committee on House Administration’s field hearing on voting rights and elections. Long story short? 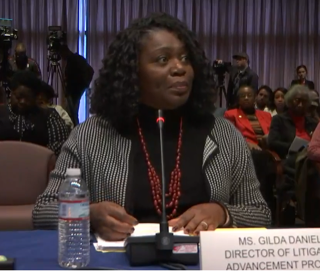 Gilda Daniels, Advancement Project’s Litigation Director blasted state officials for a litany of issues that systemically and disproportionately disenfranchised communities of color and the poor. Daniels’ testimony described Georgia’s ‘kitchen-sink’ approach to voter suppression after the Supreme Court gutted Section 5 of the Voting Rights Act (VRA) in Shelby v. Holder. Not processing 53,000 voter registrations, due to lacking an “exact match” in name, Social Security number and other minor discrepancies, e.g., an extra space, a missing hyphen or other typographical errors in the spelling or spacing of their names. While Georgia’s population is 32% Black, African American voters made up more 70% of the names on that list, and 80% of applicants on that list were Black, Asian or Latino. Purging 1.5 million registered voters between 2012 and 2016. Between 2016 – 2018, Georgia purged more than 10% of its voters – nearly 670,000 registrations were cancelled in 2017 alone. Closing nearly 214 polling places during the same period. Many of those voting precincts were located in communities of color and disadvantaged areas. So what’s the solution? Restoring federal oversight of voting changes and an creating an explicit affirmative right to vote in the Constitution. Congress is now considering H.R. 1, the For the People Act, which would reduce barriers to the ballot box, and will later take up legislation restoring the Voting Right Act of 1965. We agree. And we won’t stop fighting until it does.